Oftentimes we center what we do as a barbecue sauce company around the use of the grill related to bbq items like ribs, chicken, tri-tip, steaks and more. But because we spend so much time working the grill we sometimes get burned out on the process...first prepping the meat, getting the grill ready, then managing the flame and heat over a 6 hour period. It can be exasperating especially if you have lots of other things to do. So we thought about ways that any person could make their favorite fall off the bone ribs without all the "muss and fuss" especially if you're not grilling for some national competition. If you've ever watched some of those infamous YouTube videos you'll know exactly what I mean. The long and short of it is, BBQ should be fun, it should be easy and there should be almost NO cleanup involved. With that in mind we've created, tested and are presenting here for your very own use our Oven Baked BBQ Ribs with Roasted Strawberry BBQ Sauce. Just the very sound of that Roasted Strawberry BBQ Sauce is mouthwatering, enough to make you run out and get a rack of ribs for grilling. But before all that happens let's get you properly indoctrinated in the BBQ process. Maybe it's too hot to stand next to a searing grill or maybe the weather is uncooperative. No matter since we'll be making the ribs in the oven we can forget about all the outdoor shenanigans. We've got four things going on with this recipe, first the ribs, the dry rub, the bbq sauce and let's not forget the oven. On the ribs, you'll want to buy the best ribs you can find. I would search out the local butcher or your department store meat counter. Keep in mind if you pick up a packaged set of ribs that are full of reddish liquid then the ribs are a No, No. That reddish color is the blood drained out of the meat that surrounds the ribs. You want as much of that liquid as possible to remain within the ribs which will eventually be evaporated and cooked off during the heating process. If the liquid is out of the ribs before starting it will be very hard to keep the meat juicy. There are ways to get some moisture back into the meat but believe the process is long and arduous so let's just find the better quality ribs. 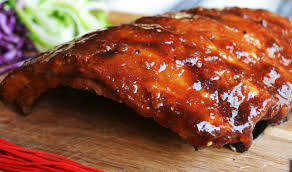 Now in preparation for this Oven Baked BBQ Ribs with Roasted Strawberry BBQ Sauce recipe the ribs most likely will require cleaning, so take a paper towel and peel back the white-gray film that resides on the back of the ribs. Pull as much of the film off as possible. Keep in mind it is much easier to remove the film when the meat is closer to room temperature. Since we're all about short cutting the process we'll teach some tips and tricks to make the process faster and easier. At this point you want to find some basic yellow mustard, the cheaper the better. Coat the ribs completely with the mustard then place them in a container or zip type bag. Store the bag in the fridge while we move on to the next steps. Now's the perfect time to begin the process of building the roasted strawberry barbecue sauce. We recommend using Jake's Famous Really Good Mild BBQ Sauce as the base mixture. Next let's get the strawberries roasted. First make sure your strawberries have been cleaned of any debris. Layer a cookie tray with parchment paper. Follow that by turning your oven to the roasting setting. Effectively we want to roast the strawberries at about 425 degrees. Keep in mind we won't be doing this for a very long time but will instead use the oven to kick off the critical part of the process. Roast the strawberries until the appear caramelized but not burnt. We want the flavor of the strawberries to concentrate but not carbonize. Depending on the number and size of the strawberries we expect them to take about 15 minutes when the oven is operating at optimum levels. If you are planning on making the ribs right after the blending of the strawberry ingredients leave the oven set to 350 degrees. The maintained heat setting will be perfect to get the ribs off to a roaring start. Remove the roasted caramelized strawberries and hold aside. If using Jake's Really Good Mild BBQ Sauce combine that with the preserves, adobo, balsmic vinegar, soy sauce and cilantro. All the other spices used in the ingredient listing are already combined within the BBQ Sauce so we won't have to add them twice. Place the mixture in a pot on the stove and bring the pot to a boil. Once at boil reduce the heat to simmer and allow the sauce to build in flavor for about 10 minutes. Remove the warm sauce and all it to cool for about 5 minutes. Pour the entire mixture into a blender. If you have an immersion blender then great, but if not a standard blender will do as well. Blend the ingredient until the sauce is smooth. Once smooth remove, pour into a jar and place in the fridge. With the sauce built it's time to get those ribs done. Let's remove the ribs from the fridge and coat them generously with Jake's Famous Tri Tip, Steak and Rib Rub. The rub contains copious amounts of herbs and spices and is a natural product which will blend especially well with the final sauce. Once the meat is coated on all sides place the ribs back in your container and hold on your counter. Now turn you oven setting to 350 degrees. Once the temperature is achieved remove the ribs from their container and place on a cooking sheet coated with parchment paper or aluminum foil. If you have a roasting pan that will work as well, just ensure the bottom is coated with parchment or aluminum to minimize clean up. Roast the ribs in the pan open faced for about 1-1/2 hours. Remove the ribs and coat thoroughly with the roasted strawberry bbq sauce. Wrap the ribs in foil leaving a slight open for steam. Cook and additional 30 to 45 minutes checking the temperature of the ribs as you go. At this point we want to have the ribs achieve a minimum temperature of 170 degrees. We like our ribs done a little more so a good temperature for us is around 190 degrees. Caramelizing is a nice add for this set of Oven Baked BBQ Ribs with Roasted Strawberry BBQ Sauce. To caramelize the ribs turn the oven up to 450 degrees. Ensure that the foil over the ribs is split open. The heat will cook and bubble the sauce on the ribs creating the caramelizing effect. Allow the ribs to cook about 10 minutes. Check at the 5 minute mark to ensure that the ribs are not burning. Once done remove the ribs and allow to rest for a minimum of 15 minutes. After resting pull out a sharp knife and slice the ribs. Keep in mind sometimes the ribs become so tender they actually fall apart. But the caramelizing process tends to draw the meat inward toward the bones reducing the chance that they will actually break apart. Serve the ribs with coleslaw, potato salad, French Fries and more. Now that you've received excellent instruction on Oven Baked BBQ Ribs with Roasted Strawberry BBQ Sauce you'll need some practice materials to get you going. And Right Now if you go to our SPECIALS PAGE you'll get some excellent pricing on our award winning dry rubs, sauces and seasonings. You'll Get an immediate 10% OFF when you use Jake's product savings Code: 1707200910 at checkout.